Paints & Coatings « Global Market Insights, Inc.
With a major surge witnessed in the construction industry, the global silanes market is also expected to witness significant growth trends as silane finds wide application in the construction industry for its favorable adhesion and noise insulation properties. Apart from its use in construction, silane also acts as a good medium for improving performance of paints and coating by imparting crosslinking abilities for coatings to adhere to a wide variety of substrates. Such properties are desirable not only in the construction industry but also in automotive, paints and coatings, packaging etc. which has provided silanes industry with a wide expansion scope. Moreover, silanes are used as a precursor to elemental silicon which in turn has found widespread application in the electronics industry as the chief element in semiconductors. 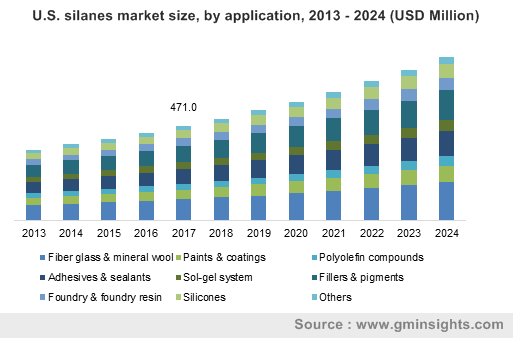 The myriad applications of silane in industries that are rapidly expanding have helped propel the silanes market, which is expected to surpass $3.9 billion by 2024 in terms of valuation. According to a report compiled to predict the dominating trend for global construction by 2030, it was noted that U.S., China and India would be the leading countries that world impart a major boost to the global construction industry. It is anticipated that by 2030 the global construction output will grow almost by 85% and generate almost $15.5 trillion in terms of revenue with the three leading countries accounting for 57% of the total growth. The U.S. construction market is expected to expand faster than the China construction market with an annual growth rate of 5% and the former will overtake the latter within the next 15 years. Meanwhile construction rates in India will eventually overtake that of Japan and by 2021 become the third largest construction market in the world. In fact, the Indian construction market is anticipated to grow almost twice as fast as China with the urban Indian population estimated to reach 165 million by 2030, Delhi becoming the world’s second largest city with 10.4 million people. By 2030, Indonesian construction industry is also expected to overtake that of Japan and in Latin America, Mexico will overtake Brazil. With such positive growth statistics, predictable that silanes market will witness significant expansion over 2018-2024. Silane is extensively used in the promotion of fiberglass and mineral wool adhesion, materials that are widely used in the construction industry. Mineral wool is used to promote acoustic insulation in the residential and commercial buildings as well as for thermal insulation which helps in energy conservation. Therefore, the silane market is growing with the heavy demand created in the construction industry. Speaking of energy conservation and increasing energy efficiency in buildings, various government initiatives have been launched that ensure that builders adhere to the strict rules of constructing buildings that are help in the conservation of energy and bringing down the carbon footprint of buildings. For instance, the Indian Ministry of Power recently launched the ECO Niwas Samhita that is essentially a code for energy conservation in construction of residential buildings. The move has been undertaken keeping in mind the significantly expanding building sector and the fact that in the coming 10 to 15 years, residential buildings will create the highest demand for energy. With the code being implemented with an intension of saving up to 125 billion units of electricity per annum by 2030, it is imperative that materials like silane will be used extensively to achieve such energy efficient construction ends, clearly adding a major boost to the silanes industry. Silane also finds application in the manufacturing of solar cells and considering the booming solar energy industry in North America and Europe, it is anticipated that the silane market will register major growth trends through the deployment of increased solar power application in the two regions. Notably, the global solar photovoltaic capacity, which was 5 GW in 2005, has increased to 306.5 GW in 2016 with Germany alone having installed 41.3 GW of solar PV. In 2016, the solar PV market in the U.S. has been estimated to have worth $4.7 billion with solar technologies being heavily funded and the Solar Investment Tax Credit adding to the incentives of investing in solar power expansion. With solar power being one of the most intensively used form of renewable energy, silanes market will garner momentum on account of the product being a constituent of solar PV and amass significant growth in terms of revenue over 2018-2024. This entry was posted in Bulk & Specialty Chemicals and tagged Adhesives & Sealants, Fiber Glass & Mineral Wool, Fillers & Pigments, Foundry & Foundry Resin, Global Silanes Market, Halosilanes, Hydride Functional Silanes, Organofunctional Silanes, Paints & Coatings, Polyolefin Compounds, Silanes Market, Silanes Market Share, Silanes Market Size, Silicones, Sol-Gel System. Owing to a widespread application portfolio along with the increase in pyrotechnic activities, the global strontium market has been observing a remarkable growth over the last few years. Numerous research studies have revealed that strontium plays a crucial role in keeping bones healthy. It slows the rate of bone loss, assists in calcium absorption, prevents bone pain, helps in restoring alkaline state, enhances resistance to fracture, regulates bone breakdown, and boosts bone formation. Natural strontium has proved to be helpful in relieving the bone pain in patients with metastatic bone cancer, as per reliable sources. It has also been found that supplementation with strontium deposits the mineral in the bone lesions, essentially suggesting a possibility of utilizing the element to mineralize areas in which cancer-associated bone loss has occurred. Owing to all the superior properties and benefits mentioned above, strontium is being widely used in medical and dental applications in the recent times. 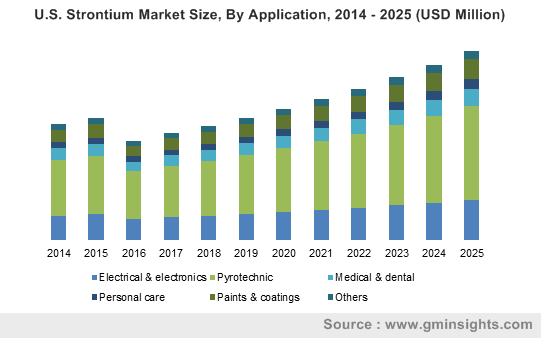 In fact, as per the research report by Global Market Insights, Inc., the medical and dental application segment is slated to account for nearly a tenth of the overall revenue share of the global strontium industry by the end of 2025. Speaking along similar lines, several biotech and pharmaceutical majors have focused on developing products fortified with strontium chloride to mitigate cancer bone pain in patients suffering from painful skeletal metastases. The biotechnology acceleration development firm Q BioMed Inc., for instance, recently filed a supplemental regulatory application with the U.S. FDA to receive the approval to construct its new production unit, which would develop non-opioid injectable named Strontium Chloride Sr89 Injection USP. For the record, FDA has already approved the drug which reduces bone pain in patients suffering from bone metastases. The survival rates of patients with prostate and breast cancers, which are at high risk of developing bone metastases, would witness an uptick owing to the development of superior drugs and injectables such as Strontium Chloride Sr89 Injection USP. This would, in turn, fortify the medical and dental applications segment of the strontium industry in the upcoming years. The increasing usage of firecrackers on festive occasions in Asian nations such as China and India have resulted in strong demand for pyrotechnic operations in this region. In this regard, it would be prudent to mention that the colors of most modern fireworks involve metal chlorides – one of the most prominent being strontium chloride. These pyrotechnic operations are majorly deployed in several entertainment activities along the likes of sports events, concerts, and various ceremonies, essentially boosting the Asia Pacific strontium industry share which is estimated to register an annual growth rate of 6.5 percent over the projected time frame. While the growth in pyrotechnic activities is on the rise, the usage of synthetic strontium is likely to decrease as stringent government regulations are being implemented to curb pollution across several nations. Moreover, steps are being taken by prominent research organizations to develop eco-friendly firecrackers (devoid of strontium nitrate) to reduce air and noise pollution. In this context, it would be imperative to take note of the less polluting firecrackers recently developed by CSIR, the premier national R&D organization of India. Needless to mention, the development of green crackers, e-crackers and less polluting firecrackers would diminish the demand for strontium for pyrotechnic activities, essentially limiting the growth prospects of strontium industry in the times to come. Companies such as Chemalloy Co, NOAH Technologies Corporation, Shenzhou Jiaxin Chemical Co., Prochem Inc., Joyieng Chemical Limited, Canteras Industriales, Química del Estroncio, BassTech International, Solvay, and Sakai Chemical Industry Co., constitute the competitive landscape of strontium market. Driven by strong growth in medical and dental applications segment along with the increasing usage of strontium in pyrotechnic activities, the strontium industry is set to garner substantial proceeds in the years ahead. This entry was posted in Bulk & Specialty Chemicals and tagged Dental, Electrical, Electronics, Global Strontium Market, Medical, Paints & Coatings, Personal Care, Pyrotechnic, Strontium Carbonate, Strontium Market, Strontium Market Share, Strontium Market Size, Strontium Market Value, Strontium Nitrate, Strontium Sulfate. The global industrial solvents market is anticipated to make promising gains in the forthcoming years, on account of burgeoning demand for printing inks, paints & coatings, and cosmetics products across the globe. In addition to this, industrial solvents are also widely used in the pharmaceutical sector, impelling the industry share. For instance, pet shampoos utilize solvents to dissolve a medicinal drug for topical treatment, provide moisture, and soften animal hair & skin. Industrial solvents are often used to dissolve ingredients and empower various solutions & manufacturing processes. They offer additional value in cosmetics, paints & coatings, adhesives, and lubricants because of their high solvency rate. For instance, Isopropyl alcohol is a multi-use solvent, which is often used as disinfectant in homes, and as an industrial solvent to dissolve substances, such as resins and oils, in production processes across various industries. 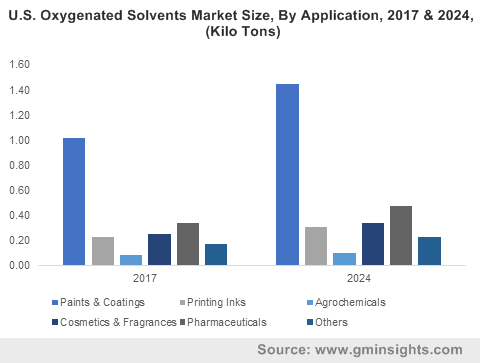 The growth in manufacturing sector coupled with favorable regulatory outlook, especially in emerging economies, would positively favor industrial solvents market growth in the ensuing years. The global paints & coatings market is anticipated to witness an upswing in terms of revenue in the approaching years, due to rising adoption across the building and construction sector. The paints & coatings industry is one of the biggest consumers of industrial solvents, attributable to the capability of solvents to disperse or dissolve the components in paint formation, to create paints of the desired consistency and eliminate globs or clumps. Apart from the construction sector, paints and coatings are widely used in the automobile industry. For instance, glycol ether esters are at times added to certain spray paints to avoid drying up in mid-air. The slow-paced evaporation of this powerful solvent group enables cars and other vehicles to get a smooth and flawless paint application for an appealing and durable finish. In addition to the factors mentioned above, it is important to note that no single solvent has the capability of dissolving all of the film-forming ingredients employed in contemporary coatings. The application of optimal thinners and reducers is usually needed, which consists of blends of various solvents, wherein each can dissolve one or more ingredients within a given coating formula. 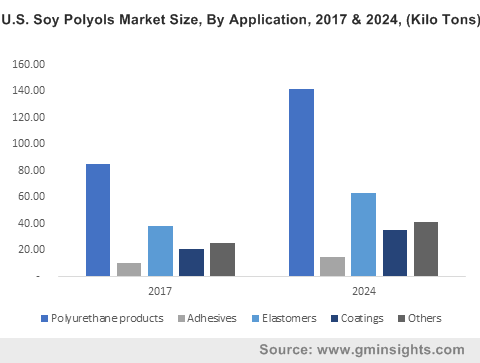 This has been leading to increased product usage per application, thereby considerably contributing towards industrial solvents market growth. Numerous printing inks, used worldwide to print everything from books to food packs and labels, rely heavily on industrial solvents for accurate application to attain the vivid colors. In printing inks applications, solvents are implemented to regulate viscosity and permit flow without harming printing rollers. As with paints and coatings, solvents advance drying for contemporary fast-paced printing presses. Printing inks applications have leveraged the potential of industrial solvents in a number of ways. For instance, the use of smudge-resistant ink in newspapers means no more finger staining and illegible print. Speaking of computer printer inks, they dry really very fast and are highly smudge resistant. Thus, the wide application spectrum of printing inks and brisk advancements in ink technology will create a powerful launch pad for industrial solvents market to reach new heights. The cosmetic industry relies heavily on industrial solvents to dissolve ingredients and increase the efficiency of products. Industrial solvents are widely used in lotions, shaving creams, face creams, and talcum powders to maintain the consistency of the product. For instance, Ethanol is hugely preferred by perfume companies as their solvent of choice due to its low odor. Indeed, the low boiling point of ethanol allows the solvent to evaporate rapidly and does not let it remain on the skin. Likewise, acetone or Ethyl acetate is an important ingredient of nail paints and is especially looked upon for its fast-drying potential. Besides, it also finds applications in nail paint removal products, owing to its high solvency characteristic which enables the nail paint to be removed easily from the nail. 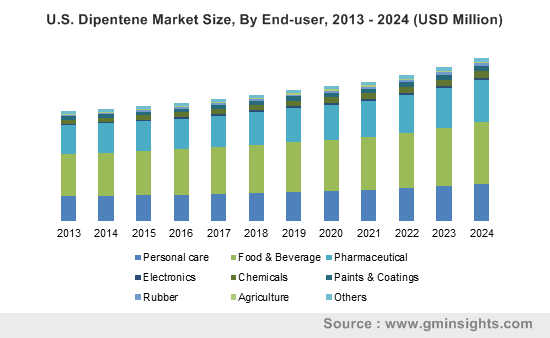 Amidst this backdrop, it is prudent to mention that industrial solvents market share will soar high in the years to come, because of abundant product demand from cosmetic and fragrances applications. Having realized the immense potential of the industrial solvents market, prominent companies such as Shell, Arkema, Honeywell, BASF, and Total have made considerable investments in R&D programs and product innovation to serve the evolving consumer demand better. Powered by the rapid expansion of the paints & coatings applications in tandem with growing infrastructure industry, the industrial solvents market is projected to attain commendable gains in the approaching years. This entry was posted in Bulk & Specialty Chemicals and tagged Adhesives, Agrochemicals, Alcohols, Aliphatic, Aromatic, Bio-Alcohols, Bio-Diols, Bio-Glycols, Chlorinated, Cleaning Products, Cosmetics & Fragrances, D-Limonene, Extraction Food Products, Global Industrial Solvents Market, Glycols, Green Solvents, Halogenated Solvents, Household Care, Hydrocarbon Solvents, Industrial Cleaners, Industrial Solvents Market, Industrial Solvents Market Size, Ketones, Lactate Esters, Methyl Soyate, Oxygenated Solvents, Paints & Coatings, Pharmaceuticals, Polymers, Printing Inks, Rubber & Polymers. The rising momentum of the automotive and construction sectors has been pivotal to the growth of the metallic pigments market that has registered increased demand lately due to the rising interest in enhanced aesthetics. Metallic pigments are becoming popular due to the enhanced visual effect that they offer in plastics, paints, coatings and inks. With a substantially improving macro-economic environment in Europe and North America as well as greater purchasing power of consumers in Asia-Pacific, metallic pigments market outlook has been witnessing increasing demand across the globe. It is rather overt that metallic pigments industry is certain to accrue mass traction from the automotive sector. As per estimates, global passenger car sales amounted to approximately more than 78 million vehicles in 2017. In terms of production and sales, China and the United Sates are touted to be the leaders in the global automotive market as is evident from the estimate that U.S. customers purchased around 6.9 million passenger cars in 2016 and produced approximately 4 million cars the same year. With major regional automotive markets such as the U.S. and China expanding by the day, the demand for metallic pigments to be used in automobile production and finish is only expected to soar. Furthermore, with established auto manufacturers quickly increasing investments in luxury and customized cars, metallic pigments industry is predicted to procure hefty proceeds from the automotive sector. It is to prudent to note however, that metallic pigments are relatively high maintenance but have better resale value while being less susceptible to small damages that can cause more value depreciation. On these grounds, metallic pigments market size has been projected to gain quite some traction through increased automotive sales. The automotive industry has often been a trend setter when it has come to colors and finishes. Rising number of surveys indicate that consumer demand for gold, silver and bronze finish is now on a rise. A marked rise in demand has been noted for silver pigments which is increasingly being used as a coating color for teletronics such as TV sets, stereos, computers and laptops. According to a global color popularity survey conducted by DuPont, silver was found to be the most popular color for vehicles in North America, Europe and Asia. Whether silver is just a trend or has become a part of the basic color palette is still a debated question but from the demand of silver metallic pigments experts have opined that silver has obtained itself the position of being the conservative color of the millennium. Many paint companies are capitalizing on rising consumer interest and have been adding metallic finishes in their collections. For instance, the UK based company ICI offers a Dulux Discovery range which comprises shades such as eastern gold, copper pot and brushed steel. According to a report published by the company the metallics have exceeded Dulux’s predictions by almost 200%, clearly indicating the future growth prospects for the metallic pigments industry. With the phenomenal growth of the metallic pigments market, pigment suppliers have been shaping new technologies to suit the industry needs for coatings and paint formulators. Such products, which can create mirror and chrome like finishes are rapidly gaining momentum in the industry. 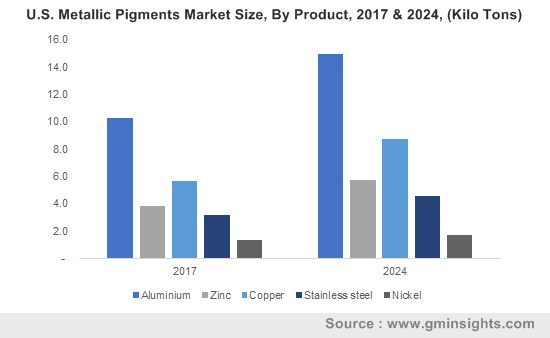 Parameters like increased competition and demand for enhanced performance are also urging metallic pigments market players to increase investment in research and development programs. Prominent pigment manufacturers are striving to bring about innovation in their product range by committing towards value addition in the basic metallic pigment properties instead of producing just a one-dimensional metallic pigment. Aided by the efforts of eminent product developers and the expansion across end-use sectors such as automotive and construction, metallic pigments market is predicted to register commendable growth over 2018-2024. This entry was posted in Bulk & Specialty Chemicals and tagged Aluminum, Copper, Cosmetics, Global Metallic Pigments Market, Metallic Pigment Market, Metallic Pigments Market, Metallic Pigments Market Forecast, Metallic Pigments Market Report, Metallic Pigments Market Size, Nickel, Paints & Coatings, Plastics, Printing Inks, Stainless Steel, Textile, Zinc. An exclusively discernible example of an industry famous among all and sundry, though not by its christened name, phosphorescent pigments market stands as one of most popularly reputed spheres at the grassroot level. 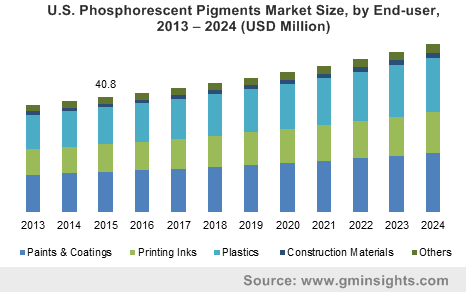 Owing to their widespread popularity, phosphorescent pigments industry players have been continually involved in R&D programs that would enhance the application landscape of this business sphere. Say for instance, the Urban Redevelopment Authority (URA), as recent as early 2017, tested four different types of surface materials on a 1,300-foot stretch of Singapore’s Rail Corridor behind a metro station in Bukit Panjang, in order to make the trial safer and more reliable for public use, without the necessity for street lighting. While the response to the luminous trail has been slightly underwhelming, it has been satisfying enough for the notion to gain weightage, prompting regional phosphorescent pigments market players to expand their R&D programs and explore the idea further with regards to practical implementation. These products, better known by their colloquial name – ‘glow in the dark’ paints, find tremendous applications across the paints and coatings, plastics, and construction sectors, pertaining to their exclusive property of light absorption and quick, controlled emission in a dark environment. Endowed with excellent temperature resistance and longer emission times, these pigments ensure the long-term appearance of a luminous effect, which can be aptly credited for the expansive end-use spectrum of phosphorescent pigments market that includes novelty toys, roads, military equipment, plastic sheets, automobile interiors, wheel coatings, fire exits, and emergency signboards. One of the domains however, that may extensively benefit from these pigments and prove to be a profitable avenue for phosphorescent pigments industry growth, is the energy sector. In recent years, in a bid to save energy and reduce expenditure on highway lighting, companies have been tapping the notion of using bright glow paint signs on roads that would guide the driver and eliminate the necessity of lighting, thereby providing a lucrative growth ground for phosphorescent pigments market players. The concept had been brought under the scanner by a Dutch company in 2014 – Studio Roosegaarde, that joined hands with a Dutch civil engineering firm called Heijmans, with the intention of developing a phosphorescent paint that can glow brightly in the dark, on the outside, creating sufficient luminescence for drivers to see the pathway ahead. Despite not being globally commercialized, the perception, back then, successfully debuted in phosphorescent pigments industry. As on today, ‘glow in the dark’ paint is being deployed across a plethora of applications in order to reduce energy consumption, which may substantially pave the way for phosphorescent pigments market expansion. Phosphorescent paint for instance, is being used to create luminous cement, that may transform the way the urban landscape is lit. Phosphorescent pigments industry firms have even been researching ways of developing ‘glow in the dark’ plants, that may direct the global populace toward a more sustainable and eco-friendly lifestyle. The pigments are specifically used for emergency exit signages, given the gravity of the situation. In fact, just recently, Councilor Mabel Acosta of Philippines stated that it would be mandatory for all the establishments to install glowing emergency exits that may help people escape during unforeseen calamities. Traditionally manufactured from an amalgamation of copper and zinc sulfide crystals, phosphorescence pigments attribute their characteristic to the unique properties of crystalline zinc sulfide and the ability of copper to activate the crystals for absorbing light and emitting the same gradually to generate a phosphorescent sheen. However, these pigments have also been developed from alkaline earth metals such as strontium, after Nemoto & Company, a Japan phosphorescent pigments market player introduced a strontium-based product under the brand name of LumiNova. Apparently, these pigments possess a higher rate of durability and brightness than the traditional zinc sulfide based products – technically speaking, these pigments have an afterglow period that is ten times higher than ZnS-based pigments, and they are also known to be free of radioactive substances, while exhibiting excellent weather resistance. In consequence, this has generated a slew of growth avenues for phosphorescent pigments industry players to come up other unique products that can be used for highlighting the phosphorescence effect, without compromise. The overtly robust demand for the product for emergency exits, lighting, and signage boards, in addition to the rapid transformation in the lighting and construction sectors, will further provide a boost to phosphorescent pigments market trends. As per estimates, phosphorescent pigments industry size is slated to expand at a CAGR of 4.5% over 2017-2024. This entry was posted in Bulk & Specialty Chemicals and tagged Construction Materials, Global Phosphorescent Pigments Market, Paints & Coatings, Phosphorescent Pigments Market, Phosphorescent Pigments Market Research, Phosphorescent Pigments Market Share, Phosphorescent Pigments Market Size, Plastics, Printing Inks, Strontium Aluminate, Zinc Sulfide.